Rome in 1800 is in political chaos. Cesare Angelotti, a former consul of the short-lived Roman Republic, has escaped imprisonment, and seeks refuge in the church of Sant'Andrea della Valle. The painter and republican sympathizer Mario Cavaradossi promises to hide him at his country villa. Baron Scarpia, Rome's tyrannical Chief of Police, suspects that Cavaradossi has helped Angelotti to escape. He persuades the painter's opera singer lover Floria Tosca, whom he himself desires, that Cavaradossi has betrayed her. She leaves to confront Cavaradossi at his villa and Scarpia orders his men to follow her, in the hope they'll find Angelotti. Scarpia arrests Cavaradossi, and tortures him in Tosca's presence until she reveals Angelotti's hiding place. Scarpia subsequently condemns Cavaradossi to death. 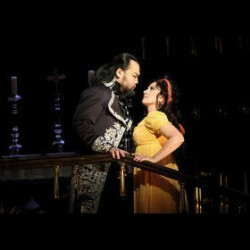 Alone with Tosca, Scarpia tells her that he will save Cavaradossi - but only if Tosca spends the night with him. Will Tosca yield to the man she hates to save the man she loves? Veuillez utiliser la boîte de recherche en haut à gauche de cette page pour rechercher des billets pour Tosca.